As the healthcare payments continue to evolve, physicians are being incentivized to move towards new approaches that emphasize quality and value. 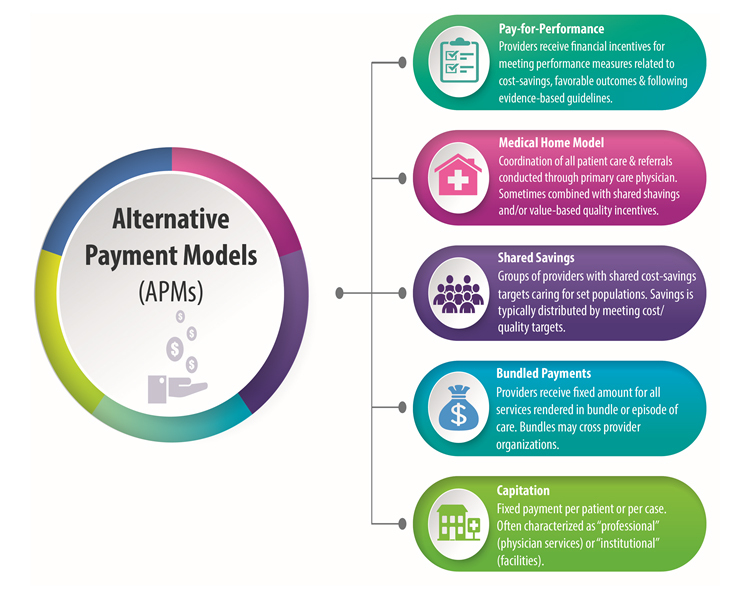 Under MACRA, these new approaches, also known as Alternative Payment Models (APMs), are set to replace the FFS model over the next decade. By the end of 2016, the Department of Health and Human Services (HHS) set a goal of moving 30 percent of FFS payments to APMs and 50 percent by 2018. In early 2016, HHS announced the 30 percent had been met due to rapidly increasing participation in APMs. In APMs, the payer and provider share some of the financial risk and rewards associated with managing and caring for patient populations. This payment arrangement incentivizes care that is better coordinated among providers, and doctors are rewarded for lowering costs. There are many different types of APMs, which will have different value-based financial awards under the Quality Payment Program. The graphic below provides a high-level overview of basic APM models.